Fieldwork for the Tunisia survey was implemented between August 9 and August 29, 2011 by Sigma Conseil, a Tunis-based research organization. The survey is nationally representative of Tunisia’s adult population: the sample size is 1,665; includes 838 men and 827 women. 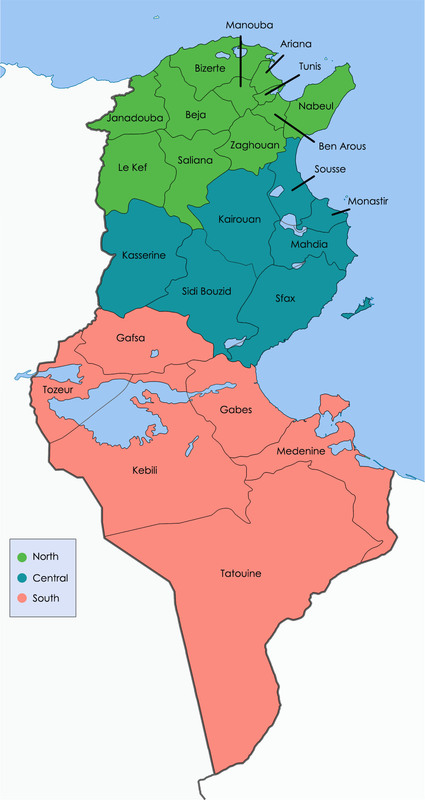 The sample represents proportionally the various regions of Tunisia, the North, Central, and South. See map for regions covered in the survey. A total of 188 Primary Sampling Units were selected from the 24 governorates using the probability proportionate to size (PPS) selection method. The margin of error is ± 2.4%.